Cet hommage émouvant aux « Hot Shots » de Granite Mountain profite de la réalisation assurée et vigoureuse de Joseph Kosinski. Kosinski a su réunir une distribution tout étoiles (mention à Jeff Bridges), mais celle-ci doit parfois faire passer des dialogues souvent plaqués. Cela dit, l'émotion pointe quand même parfois au détour. Il faut également reconnaître une qualité indéniable à ce drame malgré tout assez bien dosé et humain : il s'agit d'un film honnête pour un public mature. Blending real-life heroism with awesome disaster-movie spectacle, this portrait of the Granite Mountain Hotshots deservedly celebrates the courage to fight wildfires. Real-life story of Arizona "hotshots" taking on wildfire blazes pays solid, old-fashioned tribute to men who lead dangerous lives. True-life tale of heroism and sacrifices finds room for rich, complicated characters. 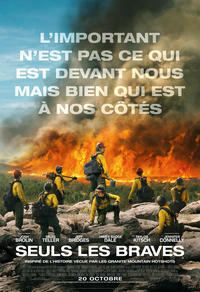 (...) Only the Brave tells its story in a sincere and relatively non-exploitative manner that isn’t overly dominated by visual effects, and the cast does some very good work as well. The pace never lags and all the performances have an air of authenticity that makes this one a cut above. Were the movie biz fair, this would be a blockbuster.